This brief fall tour of Wisconsin festbiers brings me to Oktoberfest Lager from Central Waters. What better way to follow up the post on O-toberfest than to cover the brewery that helped to inspire the founding of O’so. With Central Waters’ great 16 year history of brewing, the highlight arguably being their amazing barrel aged beers, this is definitely a beer that I went into with high expectations. Before getting into the review however, let’s briefly touch upon the brewery’s history. After spending two years restoring an original Model-A Ford dealership, and converting the building into a brewery, Mike Elwain and Jerome Ebel founded Central Waters Brewery in Junction City, Wisconsin in 1998. Scaling their homebrew recipes up to commercial production, Mike and Jerome rolled out their original lineup, two of which are still available, Ouisconsining Red Ale and Mudpuppy Porter. In 2000, Central Waters released their first, of many award winning beers, Kosmyk Charlie's Y2K Catastrophe Ale, a 10% ABV Barleywine, which took Bronze at the 2000 year's World Beer Cup. After a few months running Central Waters, Mike and Jerome brought in Paul Graham to act as the brewer, a move that was fortuitous as it turns out. Three years after opening, the original duo sold the brewery to Paul Graham and local home-brewer Clint Schultz. These two expanded the line up to include Lac Du Bay India Pale Ale and Satin Solstice Imperial Stout. Following the change in management Central Waters purchased a bottling line and started rolling out 6-packs. Unable to keep up with the spike in activity the original brew kettle cracked, leading the duo to purchase a 15-barrel brew house and two 30-barrel fermenters on the Central Waters five-year anniversary. In 2006, Clint Shults left the brewery, with his stake going to Anello Mollica, who brought his 24 years of brewing experience to Central Waters. Central Waters continued to expand, moving into the current brewhouse in Amherst, Wisconsin in January of 2007, in order to support demand. 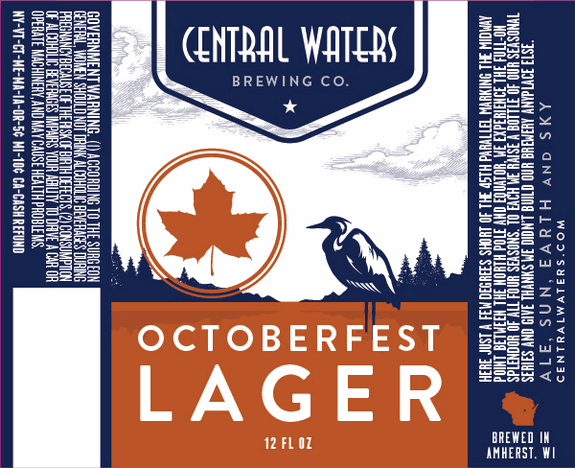 With distribution in over 200 retail locations in Wisconsin, and 18 beers in the current lineup, Central Waters has developed a strong presence in the region and become one of the state’s best breweries. Central Waters doesn’t just brew great beer however; they are also one of the country’s most environmentally sustainable breweries, taking a wide range of steps to minimize their environmental footprint. The beer industry isn’t known for being especially environmentally friendly, but its great whenever a brewery takes concerted steps to make their product have as small of a footprint as possible. To that end, Central waters sources bottles from the greenest manufacturer in the county, uses post-consumer recycled cardboard for all packaging, and sources all hops and barley from local farmers?. The brewery sources barley from Bries Malting in Chilton, WI and was one of the founding breweries of the Midwest Hops and Barley Coop. Both moves are part of a larger aim to support the local production of hops and barley. While sourcing locally and sustainably is one of the cornerstones to being environmentally sustainable and responsible; the remainder is all about resource and energy usage, and Central Waters has that covered with their 2 large solar arrays. One is a solar thermal array that provides hot water to heat the 12,500 square foot brew house and to pre-heat water for brewing. The other solar array is a 20kW photo-voltaic array that produces 20% of the breweries total annual power. The tasting room likewise exhibits their commitment to environmental sustainability with the bar in the sample room made out of recycled materials. The combined efforts have led to Central Waters gaining entrance into the state of Wisconsin’s Green Tier program, which recognizes businesses that are sound environmental stewards. They are also currently the only brewery in the state that is a member of the state’s Green Master’s program. Representatives of the brewery also promote sustainability by giving speeches and presentations local and regional events in addition to helping other members of the industry adopt environmentally friendly practices. It’s always great to see a business that not only cares about their own bottom line, but also the health and wellbeing of their local economy and environment. That is really just one more in a long list of many reasons why the craft beer industry is so great. That was a little lengthy, so let’s get back to the review. At Beeradvocate, Central Waters Oktoberfest currently has a score of 80. Over at ratebeer, it has a 49 overall with an 82 for style. Again with the considerably lower rating on an Oktoberfest over at ratebeer, at least for an overall score, it seems a bit strange. With an enticing, bready maltiness characteristic of traditional Marzen-style lagers, Octoberfest is a radiant amber-colored brew that finishes crisp and clean. Enjoy this fall seasonal as summer turns to autumn and the colors of the Northwoods are ablaze. Central Waters Oktoberfest pours a crystal clear light coper with a moderately thick small bubbled white head that holds very good retention before fading to a hazy layer surrounded by a thick collar at the edges of the glass. Biscuity malts with a hint of clover honey come to the forefront in the aroma with faint toasted malts lingering in the background. Over all, the aroma is very bready with an excellent malty sweetness and the right amount of toasted malt characteristics to round it out. A large dose of bready malts about in the flavor profile, and are balanced out with a very well rounded, moderate level of hop bitterness. The bitterness serves to offset some of the sweet malts and leads to a drying finish that feels like a more delicate transition than the other beers reviewed in the Oktoberfest series so far. Medium bodied, with a moderate level of carbonation, Central Waters Oktoberfest is most definitely hitting the fest bier marks. As with the rest of their offerings, Central Waters Oktoberfest is a very well brewed beer, and definitely a great Oktoberfest that you should consider purchasing. The toasted malt aromas aren’t as prevalent as some of the offerings from other breweries but they are still present and add an extra dimension of complexity. The honey notes in the aroma also added additional complexity to the aroma and served to foreshadow the sweet malts in the flavor. This is really a great beer, and whether it is the Oktoberfest for you or not all depends on how strong you want the toasted malt notes to be, this one sits at the low end for the style. Well, that’s all for tonight! Check back soon for another review!